The Healdsburg father accused of drowning his own daughter inside a Bay Area church was not in his right mind and was high on drugs during the alleged incident, a close family friend tells NBC Bay Area. Gerardo Mendoza Ordaz, 42, was arrested Sunday on suspicion of drowning his 4-year-old daughter at a baptismal font as his young son watched, police said. He was found in the parking lot afterward, police said, naked and holding his limp daughter in his arms. Angel Delangel, who has known Ordaz since he was a boy, claims the father was high on drugs and was convinced Maria Jose had the devil inside of her. "He said she had the devil inside the daughter," Delangel said. "He said the daughter is really sick and put her inside the pool at the church." Delangel lives across the street from St. John the Baptist Catholic Church in Healdsburg, where Ordaz allegedly drowned his daughter. After the alleged drowning, Ordaz carried his unconscious daughter along with his son across the street into the parking lot of the police station. The girl died at a local hospital. Ordaz, who worked in the fields at a local winery, is now facing murder and felony child abuse charges. His lawyer in court Tuesday raised doubts about his competency. "Today criminal proceedings were suspended, and he will be evaluated," Sonoma County Deputy District Attorney Jason Riehl said. During his court appearance Tuesday, Ordaz cried and was chained to a wheelchair, a common practice for inmates who are a danger to themselves or to others. 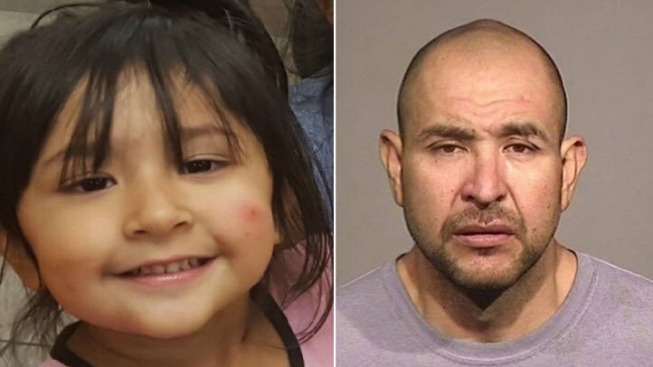 Gerardo Mendoza Ordaz, 42, is accused of drowning his 4-year-old daughter on Nov. 20, 2016 in the baptismal font at St. John the Baptist Church in Healdsburg, Calif.
Ordaz is scheduled to return to court Monday for a hearing on the doctor's evaluation. Meanwhile, family said the suspect's wife is pregnant, has three other children and is struggling emotionally and financially. The family has set up a GoFundMe account.